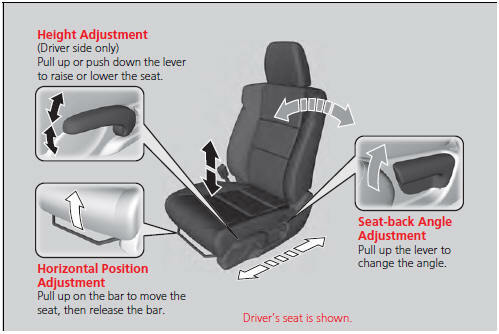 Adjust the driver's seat as far back as possible while allowing you to maintain full control of the vehicle. You should be able to sit upright, well back in the seat and be able to adequately press the pedals without leaning forward, and grip the steering wheel comfortably. The passenger's seat should be adjusted in a similar manner, so that it is as far back from the front airbag in the dashboard as possible. Sitting too close to a front airbag can result in serious injury or death if the front airbags inflate. Always sit as far back from the front airbags as possible while maintaining control of the vehicle. The National Highway Traffic Safety Administration and Transport Canada recommend that drivers allow at least 10 inches (25 cm) between the center of the steering wheel and the chest. Always make seat adjustments before driving. Adjust the driver's seat-back to a comfortable, upright position, leaving ample space between your chest and the airbag cover in the center of the steering wheel. The front seat passenger should also adjust their seat-back to a comfortable, upright position. Reclining the seat-back too far can result in serious injury or death in a crash. Adjust the seat-back to an upright position, and sit well back in the seat. Do not put a cushion, or other object, between the seat-back and your back. Doing so may interfere with proper seat belt or airbag operation. If you cannot get far enough away from the steering wheel and still reach the controls, we recommend that you investigate whether some type of adaptive equipment may help. Your vehicle is equipped with head restraints in all seating positions. Head restraints are most effective for protection against whiplash and other rearimpact crash injuries when the center of the back of the occupant's head rests against the center of the restraint. The tops of the occupant's ears should be level with the center height of the restraint. To raise the head restraint: Pull it upward. 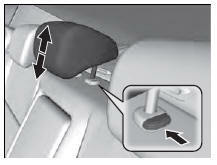 To lower the head restraint: Push it down while pressing the release button. Improperly positioning head restraints reduces their effectiveness and increases the likelihood of serious injury in a crash. Make sure head restraints are in place and positioned properly before driving. 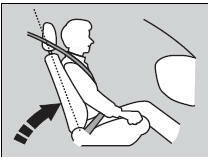 For the head restraint system to work properly: • Do not hang any items on the head restraints, or from the restraint legs. • Do not place any object between an occupant and the seat-back. • Install each restraint in its proper location. A passenger sitting in the center back seating position should adjust the height of their head restraint to an appropriate position before the vehicle begins moving. 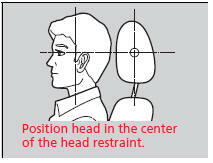 To raise the head restraint: Pull it upward. 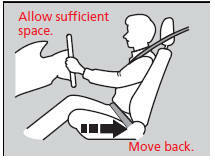 To remove a head restraint: Pull the restraint up as far as it will go. Then push the release button, and pull the restraint up and out. To reinstall a head restraint: Insert the legs back in place, then adjust the head restraint to an appropriate height while pressing the release button. Pull up on the restraint to make sure it is locked in position. 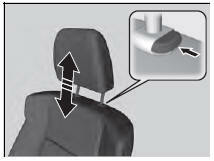 Failure to reinstall, or correctly reinstall, the head restraints can result in severe injury during a crash. Always replace the head restraints before driving. After all occupants have adjusted their seats and head restraints, and put on their seat belts, it is very important that they continue to sit upright, well back in their seats, with their feet on the floor, until the vehicle is safely parked and the engine is off. Sitting improperly can increase the chance of injury during a crash. For example, if an occupant slouches, lies down, turns sideways, sits forward, leans forward or sideways, or puts one or both feet up, the chance of injury during a crash is greatly increased. In addition, an occupant who is out of position in the front seat can be seriously or fatally injured in a crash by striking interior parts of the vehicle or being struck by an inflating front airbag. Sitting improperly or out of position can result in serious injury or death in a crash. Always sit upright, well back in the seat, with your feet on the floor.